Bittersweet Chocolate With Almonds Day. What a great day to make something with that leftover dark chocolate I had sitting in the cupboard? I made these before tea and even though no one is a big fan of dark chocolate as much as milk, they nearly all vanished. 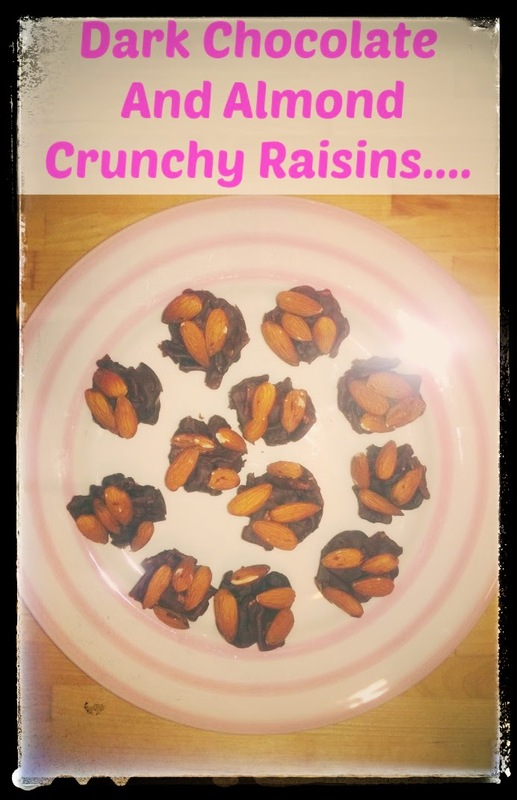 Dark Chocolate And Almond Crunchy Raisins. Bring a pan of water to the boil and simmer once boiling. In a heatproof bowl, break up the chocolate and place inside. Place the bowl in the pan over the simmering water and stir the chocolate until melted and smooth. Remove the bowl from pan and stir in the cereals and jumbo raisins. Place a spoonful in the mould. Add the almonds to the top of each. Wait for the chocolate to set. What do you think of this Bittersweet Chocolate recipe? Bittersweet Chocolate With Almonds Day: Chocolate Bark. Chicken With Pesto Courgetti And Butternut Squash..
"Cross Country Relays At Berry Hill Park…"